Justin is thrilled to be returning to the UCMB as one of the Drum Majors! 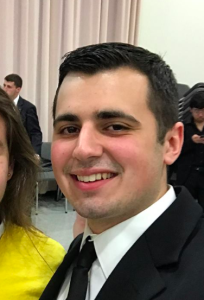 He is a senior Music Education major from Newington, CT. Prior to his appointment as Drum Major, he was a trumpet section leader for two years. He also was previously the Program Coordinator for the “Make Your Own Band Day” Program, where high school bands can receive an individualized marching and music clinic. He currently studies trumpet with Dr. Louis Hanzlik, and has received additional instruction from Andrew Sorg, Kenneth Bell, and Dave Negri. He is also currently enrolled in the Neag School of Education where he studies extensively with Dr. Cara Bernard and Dr. Joseph Abramo. He cannot wait to make the 2018 version of the UCMB the best UCMB yet!